Lemagny was considered a very brilliant pupil at the École des Beaux-Arts in Paris where his work was richly rewarded with prizes. He became well known as an engraver and began to exhibit regularly at both the Salon des Indépendants and the Salon des Tuileries. He later became a professor at the École des Beaux-Arts where he had made such a splendid record. Lemagny was much in demand as a teacher and had the reputation of encouraging the independent development of his pupils while at the same time giving them an excellent grounding in technique. Lemagny designed fifty-two postage stamps for the French government, but engraved only one which featured the image of the writer George Sand, published in 1957. 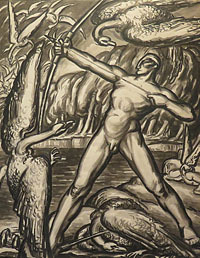 In this striking drawing, which was intended as an illustration for a poem by Heredia, Lemagny depicts the sixth labor of Hercules in his quest for immortality. After the hero had finished the daunting task of cleaning the Augean stables, Eurystheus sent him to drive away a great flock of man-eating birds which had gathered at a lake near the Greek town of Stymphalos. Athena gave Hercules a pair of bronze noisemakers to scare the birds out of the trees. As they scattered, Hercules shot them with a bow and arrow. The most famous representation of the Hercules as Archer is the bronze by Antoine Bourdelle (1861-1929), which is displayed in front of the Musée d’Orsay in Paris. Lemagny was probably familiar with this work which perhaps inspired his own very powerful vision of the myth. Listed : E. Bénézit, Dictionnaire Critique et Documentaire des Peintres, Sculpteurs, Dessinateurs et Graveurs, Gründ, Paris, 1999. India ink and India ink wash drawing on heavy wove paper with irregular edges. Inscriptions in pencil in the left margin identify this drawing as having been done by Lemagny as an illustration for a poem by the great Cuban-born poet José-Maria de Heredia (1842-1905).